We had a great time at our open skate, many thanks to Susie and the coaches for putting this together. I have a lot of photos I'm sorting through, I'll have them up soon and I'll add an announcement here and point to our photo page. 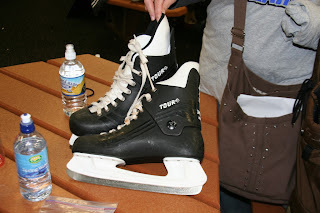 We found a pair of skates in the locker room, Susie has them now. If these look familiar, please email Susie.